Sailing north, Øksfjord is Hurtigruten's first port of call in the county of Finnmark. At above 70˚ we found ourselves in the true high north. To the southeast you can glimpse Norway’s fifth largest glacier, Øksfjordjøkulen (nearly 4,000 feet above sea level). This is the only glacier on mainland Norway to 'calve' directly into the sea, a uniquely arctic phenomenon. The district has a population of 500 and Øksfjord is the administrative center for the municipality of Loppa. 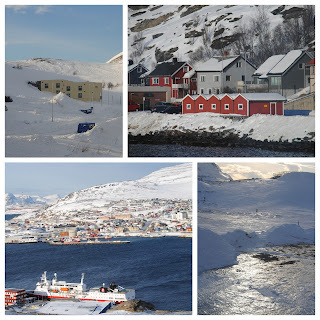 Fish processing plants and a shipyards speak to an area dependent on the bounty of the sea. The sun was starting to set as we sailed towards Øksfjord. It cast its shadow on the snow-capped mountain peaks along our route. Sailing closer to town, we could see colorful houses clinging to the dramatic mountain landscape in this small fishing community. 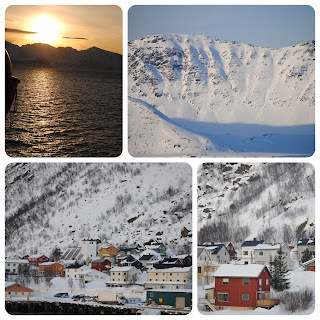 With temperatures soaring into the 90's in most parts of the United States this weekend before the 4th of July, we decided to return to our winter coastal voyage of Norway. We continue our journal on day eight. 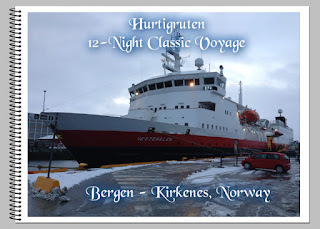 Our ship, Hurtigruten Ms. Vesteralen, visited Hammerfest, the northernmost town in the world. On arrival here, we boarded a bus which took us to the Meridian Column, which is on the UNESCO list of World Heritage sites and commemorates the first official measurement of the exact size and shape of the Earth. From there we had a spectacular view of Melkøya and the Snøhvit field. From Meridian Column, we headed up Mount Salen. Our guide explained more about Hammerfest’s unique history, including an insight into both Sámi history and culture and Europe’s first LNG factory (Liquid Natural Gas). Hammerfest was established in 1789 at the site of an ancient anchorage. The first part of the name, 'Hammer', derives from the Old Norse word, 'Hamarr', which means 'steep mountainside'. The second part of the word, 'fest', comes from the Old Norse word, 'festr', which means 'fastening' (for boats). From Salen there are great views over the town and our waiting ship. Before we returned to the quay, we drove past the town church which features unusual architecture inspired by fish drying racks. The International Maritime Organization has seen a strong momentum in the industry to address seafarer's wellbeing, particularly their mental health. June 25th, Day of the Seafarer, is a day set aside to call attention to strategies to tackle stress and other issues affecting seafarers' mental conditions - and make the tools available more widely known. Cruise lines and shipping companies have responsibilities to seafarers in their employ. The public too has a responsibility to have a positive impact on seafarers' mental health as well. 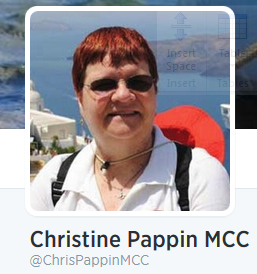 Cruising for more than 30 years, we've met many seafarers. When we recall special moments from those cruises, there is usually one or more of them at the heart of the memory. No matter how they are feeling, how tired they might be, how sad or lonely they might be, they put their best personality forward, and do everything they can to make sure our adventure at sea lives up to our expectations. If you've ever encountered a crew member who didn't live up to those expectations, odds are there is a passenger at the heart of their story. Think about that on your next cruise. They are miles from home, family, friends, and other loved ones. I've never done it, but imagine it is a hard life. It can be very rewarding I'm sure, when they see a smile or some kind gesture in return from passengers or fellow seafarers. On behalf of everyone that loves cruising like we do, thank you seafarers for all you do. Take care of your mental wellbeing - take advantage of the tools that IMO is providing for you so that you can put a smile on your face when we meet again. Often we write blog posts related to one of the day's themes as featured on checkiday.com. We couldn't resit "Museums Come to Life Day" which occurs on June 24th each year. The first thing that came to mind when seeing this day, was the "Night at the Museum" movies. Wouldn't it be cool to be in your favorite museum when the "inhabitants" came to life? We've visited many museums around the world, so we thought we'd feature some of them here and you can let your imagination bring them to life. Let's start our journey through museums of the world in one of our most recent visits. While on a Southeast Asia cruise we visited Kuala Lumpur, or commonly known as KL, Malaysia. Our first stop was at the National Museum, which was built in the style of a Malay palace. Can you just imagine if these pre-historic figures came to life during your visit? 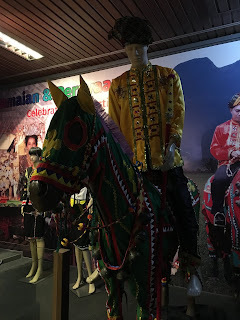 Next stop on our journey today is the Sabah Museum in Kota Kinabalu, Malaysia. The first thing that greets you as you enter the museum are enormous skeletal remains. My first thought was dinosaur! It was only when I walked closer and read the information that it was a Bryde’s whale. As you walk through the museum, you come across a Bajau horsemen in full regalia. These horsemen perform as outriders for ceremonial and state functions. Imagine he comes to life and takes you through the rest of the museum, just like in "Night at the Museum". He'd probably lead you to the Galleri Busana Textile Gallery, where some of his friends were waiting to tag along. Our final stop on this museum tour today is in South America. After seeing penguins in their natural surroundings in Punta Arenas, Chile, we explored the city. The tour took us to the Salesian Museum. One of the most visited rooms is the one devoted to Southern Patagonia, which displays a faithful recreation of the Cave of the Hands. 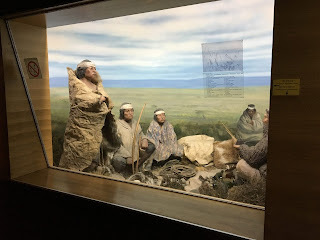 The objects and documents from the Salesian days, the handicrafts and tools made by the natives, along with the fossils and petrified animals from the area are also part of the displays in the museum. Imagine if these cave men or the animals came to life. These are just a few of our candidates for museums that could come to life. If you've not found enough inspiration, explore many more museums in our Cruise Diaries posts. Donald Duck’s first appearance on screen was in the animated short film “The Wise Hen”, on June 9, 1934. Although Donald’s birthday is said to be on March 13th in the 1949 short film “Donald’s Happy Birthday”, Disney later decided that Donald’s official birthday is June 9th, the day he first appeared in film. Thus, June 9th is Donald Duck Day. The character Donald Duck came about after Walt Disney heard Clarence Nash reciting “Mary Had a Little Lamb” in his “duck” voice, and Nash went on to voice Donald until 1984. Tony Anselmo started voicing Donald in 1985, and is still Donald’s voice as of 2017. Donald’s full name is Donald Fauntleroy Duck, and he is known for his sometimes temperamental personality, and is many times associated with his nephews Huey, Louie, and Dewey, and his girlfriend Daisy. You'll typically see Donald dressed in a sailor shirt with a flat cap, red bow-tie, and no pants! The statue on the right was captured at Walt Disney World theme park, Magic Kingdom. He looks pretty good in bronze too, don't you think. If you are a fan of Disney, you won't want to miss the art collections onboard Disney Cruise Line ships. This image of Donald Duck splashing his way through the Aqua Duck was seen onboard Disney Dream during one of our cruises. It might not be there any longer, since many of the art works are for sale. You can return from your vacation with one of your favorite characters. It makes sense that you'd see Donald Duck at sea. The image on the left was seen onboad Disney Cruise Line ship Disney Dream. 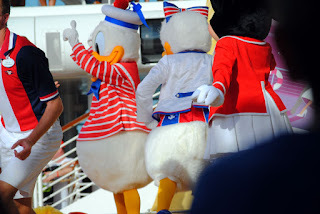 Donald was among the characters greeting passengers during the welcome aboard show by the main pool area. "It All Started With a Mouse" but this lovable duck has certainly captured the hearts of children of all ages since 1934. You can immerse yourself in the wonderful world of Walt Disney at one of the theme parks, at the movie theater, or onboard one of Disney's ships. We can help you plan two of the three. Check out the links above to get an idea of how you could become a part of the magic.